Located in Mount Beauty, Candlewick Cottage is a beautiful refurbished three bedroom cottage that provides you with fully self catering facilities. The cottage comfortably sleeps six people in three bedrooms and has a fully functional and equipped electric kitchen, laundry, bathroom and en-suite. Off street parking is available for two vehicles via rear access road. Candlewick provides you with a comfortable and cosy home away from home. Ideal for a family holiday or a romantic getaway! Located within a five minute walk to the main street, eateries and shops and only ten minutes to the local club / hotel and restaurants. A few minutes walk to a stunning lake as well as BBQ area and playground. Set in a quiet area with a wonderful high aspect overlooking Mount Beauty and surrounding mountains. 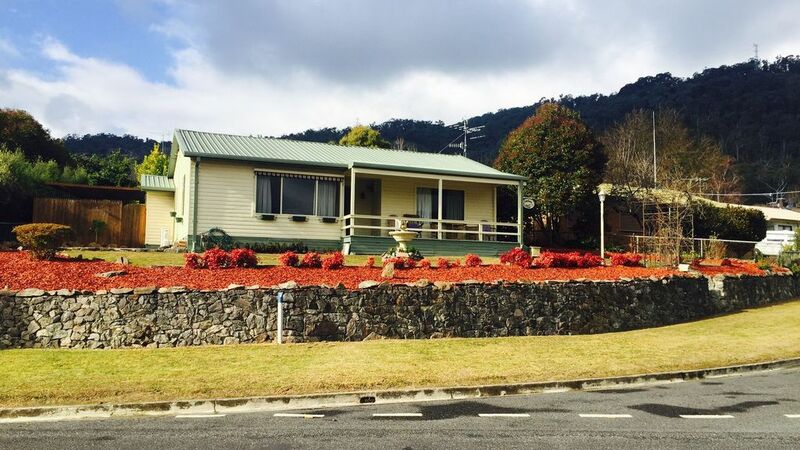 Set at the base of Falls Creek - Mount Beauty is located only 30 kilometres (approx. 45min drive) to the centre of Falls Creek. All the comforts of home in a warm cottage setting. All inclusive of kitchen utensils / crockery & cutlery. Nothing to do but simply enjoy! Linen (towels and sheets) provided at $30 per person per stay. We thoroughly enjoyed our 5 night stay at Candlewick Cottage. The little extras provided were greatly appreciated. Feeding the rosellas on the front deck was lovely and the cottage has everything you could need. Gaye and Rob were great with communication and a pleasure to deal with. We will definitely be back! Thank you Merrill for your lovely feedback. We are so glad you enjoyed your stay and the experience of Candlewick Cottage. The Rosellas are an experience of their own! Great to know you would love to return and we look forward to welcoming you back! Thankfully, as we were staying during the hottest month, the Air conditioning was working, and there were fans, and it always cooled at night, so we were pretty comfortable around the clock. Short walk to shops, quiet area, beautiful birds and views. House is fully and attractively appointed and neat with it. Hosts make friendly contact and provide all the information you could need. Pleasant stay. Thanks. The owners went out of their way to accommodate us. Although this is an older place, this was more than made up for by the equipment in the place, the very comfortable beds, the heating worked great. I could have spent all weekend just feeding the birds! Appreciate the feedback Alan and so glad you loved the beautiful birds that surround the cottage. We would love to welcome you back any time. We had 3 days at the snow with our 3 teenage boys and Candlewick Cottage suited our family well. The cottage is very clean and neat and although an older layout a lot of thought and effort has been put into renovating. The heating in each bedroom and space to relax made for a comfortable stay. We were very happy to arrive late on a cold night and walk in to a pre heated cosy cottage. The small addition of an en-suite made it good for the parents, the boys had two rooms to spread out in and all beds nice and comfortable. Kitchen worked well and a fully equipped laundry. We will happily stay and Candlewick Cottage again. Thank you for your feedback Nigel. We are so pleased you enjoyed your stay and look forward to welcoming you back again in the future. I will start with the positives. The house has everything as advertised: beds for 6, fully-equipped kitchen, laundry, etc.. We also liked the provision of a box of lego and toy cars for kids. The heating worked well, the beds were comfortable, and the views down the valley from Mt Beauty were very nice. Unfortunately we had some problems with the owner trying to change the contracted price after we made the booking by adding new charges, but hopefully that was just due to their inexperience with the Stayz system and pricing. I'll have to give them the benefit of the doubt on that. Probably I would go back again, depending on the price and what else is available at the time.